This is such a sensitive topic, not only for athletes, but in the general population. In this blog entry I am going to try and root out some common misunderstandings regarding HFCS. Corn Syrup: A syrup produced form 3 enzymatic reactions of corn starch – also known as glucose syrup. 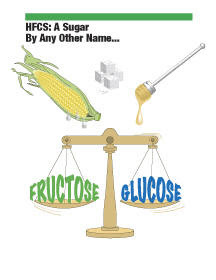 High Fructose Corn Syrup: Corn syrup further enzymatically treated to convert some of the glucose to fructose. There are 2 common types of HFCS: HFCS 42 and HFCS 55. The numbers represent the percent of fructose in the syrup after the enzymatic treatments. Right from the start you may notice that HFCS actually does not contain high amounts of fructose compared to sucrose (or honey), it is called high fructose corn syrup because compared to the 100% glucose syrup from which it is derived it has a high fructose content (the first HFCS invented in the 1960’s was only 15% fructose). High fructose corn syrup has many advantages over sucrose in food processing (cost, stability, ease of storage and transport etc.) and so the use of HFCS has gone up and sucrose use has gone down in the food industry over the past 40 years (especially in the United States). This rise in the number of products containing HFCS has led to a rise in consumption of HFCS over this same time period. The rise in obesity and diabetes has also taken place in the same time period. 1. Over the same time period of increased HFCS intake the amount of time people spend being active (especially kids) has declined. 2. The obesity and diabetes rates have been increasing worldwide (even in countries like Brazil and Egypt where no HFCS is in the food supply). HFCS makes up only 10% of the caloric sweetener used in the world. 3. During the last few years, consumption of HFCS has begun to decline, yet the rates of obesity and diabetes continue to climb. Now I will address how HFCS is absorbed by the body. It is absorbed in the exact same manner that sucrose and honey are, your body does not differentiate how it digests any of these carbohydrates. It is true that fructose and glucose are metabolized differently. This is where many of the misconceptions of HFCS being converted directly to fat come from. So when comparing HFCS, sucrose and honey it is not valid to say one is worse than the other based on metabolic pathways. So now let me tie some benefits of fructose to athletes into my little tirade. Having a little fructose mixed with glucose in a bar or sports drink (or any food for that matter) actually has been shown to increase the absorption rate of the carbohydrates as compared to just glucose. Since different receptors are responsible for absorption of fructose and glucose you are (to use the subway as an example) effectively using more “turnstiles” to get the sugars absorbed faster. Recently studies have shown that the combination of glucose and fructose is also metabolized faster than glucose alone. Now, it is true that too much fructose will cause stomach distress so as with many things, moderation is the key. Hopefully, I have given you some things to think about when it comes to HFCS and the media coverage of these types of things. As always if you have comments or want references or more information just let me know.